Cardiopulmonary resuscitation or CPR is an emergency procedure that consists of a number of steps like mouth-to-mouth resuscitation and chest compressions. According to studies conducted by the American Heart Association, CPR can significantly increase the survival chances of a cardiac arrest victim. There are several types of St Mark James courses that are offered to people who want to learn CPR. 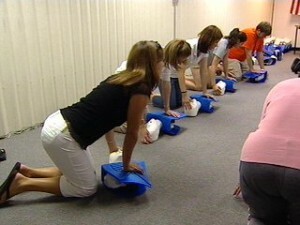 Probably the most popular type of CPR classes being taken is adult CPR. A lot of companies are willing to pay for their employees to undergo this type of training. Adult CPR training teaches basic first aid skills like learning the symptoms of certain illnesses and what to do in emergency situations. People taking the course will also learn how to do mouth-to-mouth resuscitation, chest pumps / compressions and how and when to use an AED / automated external defibrillator. Basic Life Support First Aid classes aim to teach the general public how to identify and react to common situations that might require medical intervention. The course teaches students what to check for in situations when a person is sick or injured and how to treat the person accordingly. It’s a short course that can be taught together with another CPR class but can also be easily taught to anyone. First aid and CPR courses for babies and children are very crucial classes that St Mark James is encouraging people to attend as well. These classes usually last around 9 hours and will teach participants how to react to emergencies involving children and infants as well as show the differences in methods between CPR for adults, babies and children. Parents and caregivers should arm themselves with this knowledge as babies and children are often too delicate or frail to withstand resuscitation methods used on adults. For instance, when administering CPR to a baby, only the fingertips are used instead of the hand during chest compressions. CPR classes for EMTs, first responders or health providers are different from the previously mentioned classes. These classes are usually more in-depth and focused since passing this is a requirement for those who need a professional certification. CPR classes for EMTs or Health Care Providers (HCP) train students on how to use AED and other medical equipment, how to use resuscitation masks and how to administer advanced CPR with a partner or even by themselves, if necessary. EMTs, certified CPR administrators and other professional emergency responders are required to renew their certifications every year. These classes take longer to teach since they’re more comprehensive and students are required to take a test. With more people becoming aware of animal rights and their responsibilities as a pet owner, this type of CPR class is one of the fastest growing classes in terms of popularity. People who take these classes are often pet owners and those that work in animal clinics. Pet CPR classes are often an 8 hour session that teaches how to perform CPR on animals like cats and dogs and other first aid procedures for pets.